What is an allergist / immunologist? Allergists / immunologists are specialists in the diagnosis and treatment of allergies, asthma and other diseases of the immune system. For more information about the role of the allergist / immunologist, please click here. 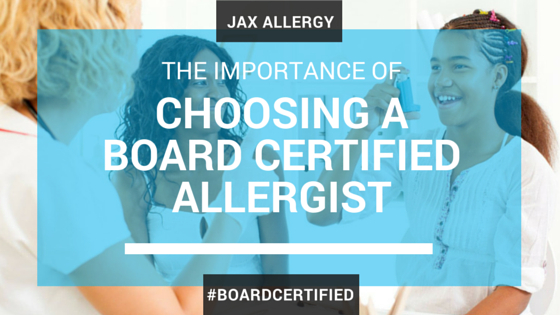 Board Certified Allergists have a minimum of 4 years of college, 4 years of medical school, 3 years of residency, plus two or more years of specialized training in Allergy and Immunology at an accredited fellowship program. They must pass board exams not only in Internal Medicine or Pediatrics but also in Allergy and Immunology, where certification is from Conjoint Board of Internal Medicine and Pediatrics. Ongoing recertification consists of yearly continuing medical education requirements and includes a written test every 10 years for each of the boards. Allergies are the result of a chain reaction that starts in the immune system. Your immune system controls how your body defends itself. For instance, if you have an allergy to pollen, your immune system identifies pollen as an invader or allergen. Your immune system overreacts by producing antibodies called Immunoglobulin E (IgE). These antibodies travel to cells that release chemicals, causing an allergic reaction. Allergens are the leading causes of nasal allergies, asthma, and allergic conjunctivitis. What is immunotherapy (allergy shots)? Immunotherapy (IT) is a treatment directed at decreasing your sensitivity to allergens. These specific allergens are identified by allergy testing. Allergy extract is a precise prescription that is formulated and prepared based on your specific test results. It contains no medication. Over time, the goal is to build tolerance to those allergens of which you are found to be sensitive on testing. A full course of IT can lead to long-term relief of your allergy symptoms even after the injections are stopped. For more information, please click here. Five is the recommended youngest age to start allergen immunotherapy. There are exceptions to this, however (for example, stinging insect allergy), where children may start at an earlier age. Does allergen immunotherapy work and will it work for me? Most patients with appropriate histories and skin testing will show a significant response to IT. This has been well documented in the literature in numerous studies over many years. However, specific response is based on many variables including patient-specific factors, specific allergens and environmental factors. Who is a candidate for allergen immunotherapy? Patients with allergic rhinitis, conjunctivitis or asthma who are not controlled with medical management and/or environmental control. Patients who would like to avoid long term medication usage or have unwanted side effects from medical therapy. Children above the age of 5 years old with allergic rhinitis may receive a course of IT to prevent the development of asthma and prevent progression to new allergies. Asthma is a chronic lung disease that inflames and narrows the airways causing shortness of breath, wheezing, tightening of the chest and coughing. In the majority of people, this underlying inflammation is caused by allergens. Asthma patients often react strongly to certain substances such as pollen, air pollutants, strong perfumes, certain foods or viruses. When these irritants hit an asthma patient's inflamed airways, the muscles around the airways tighten, restricting air flow to the lungs. Cells in the airways also react by producing more mucous than normal, exacerbating the problem. For more information, see Taking Control: A Guide for People with Asthma. Finding out what you are allergic to is an important first step to effective allergy treatment. Today allergy tests are more convenient and accurate than ever before. When combined with a detailed medical history, allergy testing can identify the specific things that trigger your allergic reactions. Allergy skin testing is performed under the guidance of an allergy specialist. These specialists are trained in the best methods for testing and treating allergies. For more on allergy testing, please click here. Prick-puncture testing is generally the first screen and is performed by "pricking" the skin on the back (or arm) with a small plastic applicator coated with the allergen. Intradermal testing is performed by injecting small amounts of the suspected allergen into the most superficial layer of skin. If you have sensitivity to a specific allergen, a small wheal and flare (similar to a small mosquito bite) is seen within 15-20 minutes. This is measured by the technician performing the test. What are some side effects of allergy skin testing? Skin testing is generally well tolerated. The most common reaction is local itching and swelling of the test site which resolves within a few hours. Other possible side-effects include itching of the eyes, nose, throat; runny nose, wheezing, light-headedness, hives and nausea. Strongly positive reactions may induce low blood pressure and shock in an extremely rare circumstance. The staff is trained in appropriate management of each of the above possible reactions. How often do I need to come for shots and how long does therapy last? Allergy shots are started with very small doses given at frequent intervals. This is called the build-up phase. The strength is slowly increased at an interval of 1-2 times per week. The duration of this phase depends on the frequency of the injections but generally ranges from 6-12 months. This is followed by the maintenance phase where the injections are spaced out as tolerated to every 2-4 week intervals. Once the appropriate response is achieved, typical treatment is 3-5 years. If shots are stopped or the interval lengthened and a patient perceives a return of symptoms, a patient may be a candidate for a course of extended immunotherapy. The decision to stop immunotherapy must be individualized.